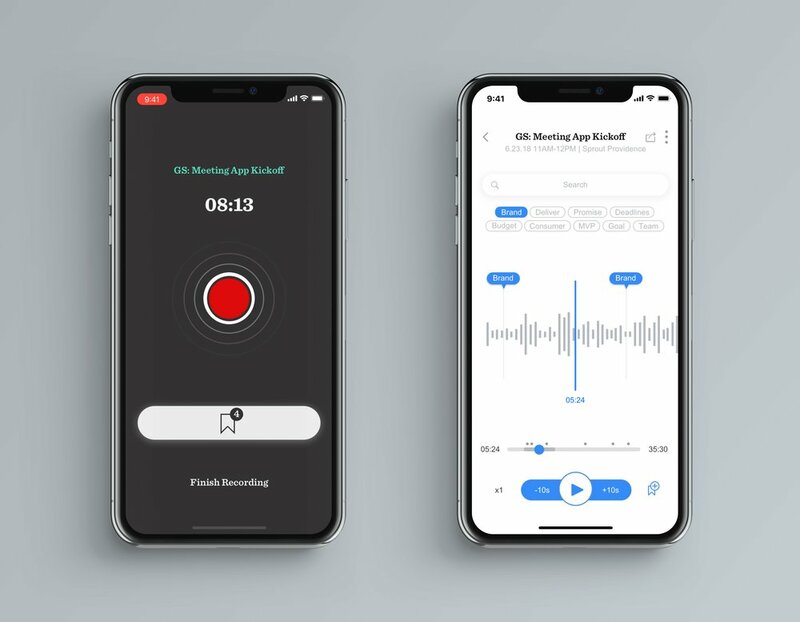 Imagine an app that combines the peace of mind of having a recording with the ability to search and quickly find details from those meetings. Sounds pretty sweet, right? We think so too. That's why we're building Retriever. At Giant Shoulders, we love working with startups. We are one ourselves. We started our agency because we want to use design to solve problems in the world of nimble and fast-moving startups. We tend to collaborate a lot with our clients and among ourselves, and we want to be fully present and engaged. While we do take notes during these collaborative meetings, we often find ourselves missing parts of the meeting or feeling unable to be present entirely. We want to be fully engaged in meetings. We are a highly collaborative group. We bounce ideas off of one and other all the time, and we work with our clients through meetings and workshops. The best meetings we have are those where everyone is fully engaged – phones on silent, facing down, everyone involved in the conversation, gesturing with both hands. These are the meetings where I am tempted to break my own rule and take out my phone to snap a photo that captures these rare moments. So what is stopping us from meeting that way? Designate a notetaker – we don't want to waste a valuable team member's time on taking notes, nor do we have the money to spend on hiring a proper scribe. Record the audio – this is mostly meaningless because it's such a pain to listen back to a long recording in search of what we are looking for. It's like finding a needle in a haystack - annoying and painful. Take notes ourselves – we default to doing that, mostly because we are trained that way, and it makes us look grown-up and responsible. While we like the peace of mind of having a recording of our meetings, we almost never go back through the recording. So we are building an app to change the way we meet, by combining the peace of mind of having a recording with the ability to search and quickly find details from those meetings. Imagine if you could type and search for a word or phrase and the app fast-forwarded you to the point where it was said. This way you don’t have to scrub through the entire recording trying to remember what the order in which things were said to find what you're looking for. Sounds pretty sweet, right? We think so too. That's why we're building Retriever. Check it out at retrieverapp.com.